Melissa & Travis were married on the beach next to Jennette’s Pier and had a gorgeous Nags Head wedding full of nautical touches! 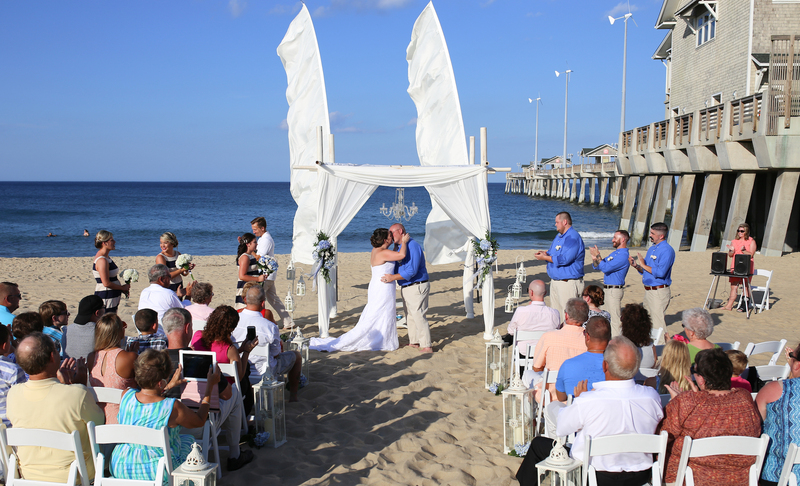 The beach wedding was setup by I Do OBX Chairs, including the chairs, arch & even wedding party flowers! Tony Joseph of I Do OBX Weddings also officiated the oceanfront occasion. Hot Heads** made sure the bride & her ladies were photo-ready with hair & makeup. After the ceremony on the beach, guests gathered in the beautiful Jennette’s Pier for the cocktail hour & reception. Currituck BBQ Company catered delicious Southern fare, including their famous North Carolina Pulled Pork BBQ and the staff even donned denim overalls & joined guests on the dance floor for a few songs! Later guests enjoyed cupcakes from Cakes by Robin, which we setup on crates provided by the bride. John Harper the DJ provided the music for the evening and kept the guests on the dance floor. Jennette’s Pier is such a great venue not only because of the views but they also provide all of your tables & chairs for the reception. Additional rentals like the dance floor & linen were via Ocean Atlantic Event Rentals. To see all of this seaside summer wedding in action, check out the photos from Coastal Shots below! **Hot Heads is no longer in business on the Outer Banks, however it has been bought by Esther Faith and is now Salty Hair Salon and better than ever! Ashley, Thank you so much for featuring our wedding!!! Can’t believe it’s almost a year ago!!! Thanks for your help! We couldn’t have had such an amazing day without you!